Hundreds of pro-Palestinian activists took to the streets of the Belgian capital in protest at a visit by Israeli Prime Minister Benjamin Netanyahu. Netanyahu is in Brussels to meet with EU foreign ministers to confront Western European positions on Israel. But the organisers of the protest questioned the timing of his visit. "Netanyahu is here today just after Donald Trump's decision to recognise Jerusalem as the capital of Israel," said Simon Moutquin of the Belgian-Palestinian Association. "As if the bible is some form of land registry. It's shameful that someone who has destroyed 1.2 million euros of european humanitarian projects is now welcomed with croissants for breakast." Another protestor demanded a stronger reaction from the EU. "We are calling for all European countries to make a shock move like Trump did over Jerusalem. This means a rapid recognition of a Palestinian State," said Hamdan Al Damiri, a Palestinian activist. 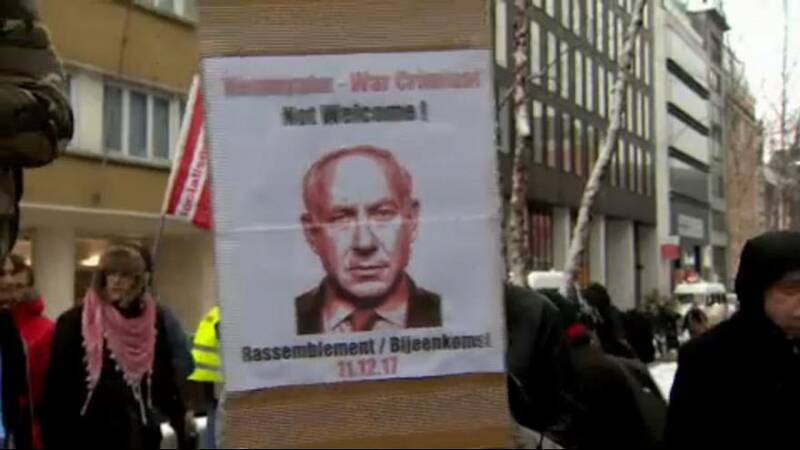 The protests in Brussels follow those in Paris over the weekend when Netanyahu met with the French President Emmanuel Macron.